Idaho ACEP is the local chapter of national ACEP, the American College of Emergency Physicians. Idaho ACEP exists to support the availability of high-quality emergency medical services to all patients within the state of Idaho, and to advocate for our physician members, our patients and our specialty. Founded in October 1976, the chapter actively represents nearly 170 emergency physicians working at hospitals throughout Idaho. Idaho ACEP is a diverse and democratic organization that promotes and preserves the integrity and independence of emergency medicine. We are actively involved in a wide range of issues that matter to emergency physicians and our patients, including ongoing legislation and advocacy, public health and safety, physician wellness and resiliency, patient advocacy, and disaster preparedness and response. 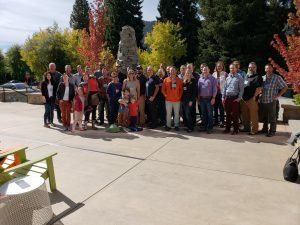 Our chapter is actively involved with the state wide Time Sensitive Emergency Committee, the Idaho Statewide EMS Physician Commission, the Idaho EMS Advisory Council, various county medical societies and a myriad of other associations and committees that affect emergency medicine physicians and patients. We are also active on legislative issues and testify before both the House and Senate, as needed. As a member of Idaho ACEP, you are making sure your voice is heard by state lawmakers, your physician colleagues, and your patients. You are also learning about issues that affect you and your patients and you are contributing to the advancement of your specialty.